Daikin Wall Mounted Low Inverter 2.5KW System. FTX-KV / RX-K Suitable for bedrooms, living rooms or small offices. > Auto-swing mode for vertical louvres, blows air up & down to ensure good temperature distribution (not able to be selected at same time as comfort mode). All indoor units are fitted with titanium photocatalytic filters to help provide a supply of clean air in the room. Operating sound levels can be as low as 20dBA, meaning the units are very unobtrusive. The FTX-KV range is available in capacities from 2kW to 7kW, and is also connectable to multi series outdoor units (2MXS series) giving the ability to provide heating or cooling in 2 rooms from one outdoor unit. The FTX-KV series wall mounted unit has Energy Labels of up to A++ and represents a good value comfort cooling solution. Suitable for bedrooms, living rooms or small offices, the FTX range has an operating range down to -10°C in cooling. All models are equipped with an infra-red remote control with a daily timer. The option of changing the remote to either a. Hard-wired option, or an on-line controller using. The FTX-KV / RX range come equipped with features to help ensure comfort: > Powerful mode that delivers a 20 minute boost of heating or cooling to rapidly help the room reach setpoint. > Comfort mode which prevents air blowing directly onto people in the room by directing cool air up and warm air down. The item "Daikin wall mounted Low Inverter 2.5KW Air Conditioning Unit" is in sale since Friday, March 16, 2018. 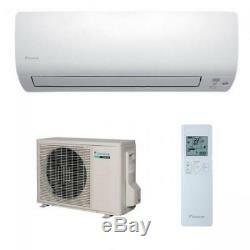 This item is in the category "Business, Office & Industrial\HVAC\HVAC Units\Central Air Conditioning Units". The seller is "sub-zerorefrigeration" and is located in Caerphilly, Caerphilly. This item can be shipped to United Kingdom.